According to a study by World Animal Protection, the popularity of elephant tourism is fuelling a rise in the animals being captured from the wild and kept for entertainment. The research team says the captured number in Thailand has increased by almost one third over the past five years. 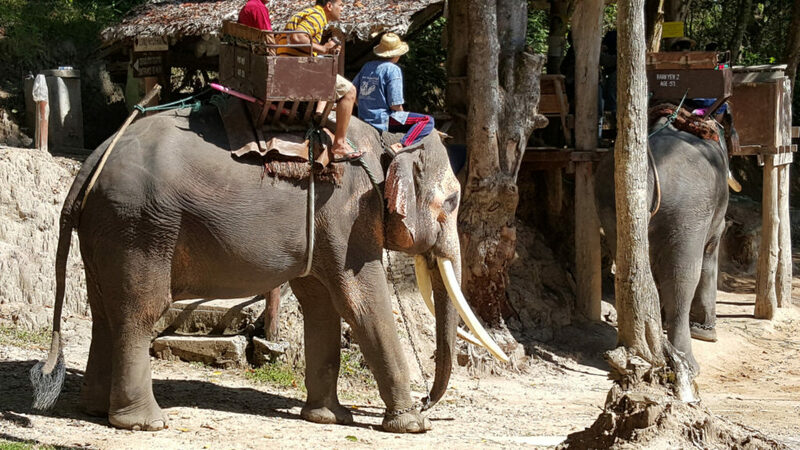 Thailand has twice as many elephants in tourism as all other countries combined to begin with, and estimates are that 40% of the country’s 30 million annual visitors take an elephant ride. Elephants in the tourism industry are taken from their mothers as babies, forced to endure harsh training, and suffer poor living conditions throughout their life. Researchers inspected 220 venues and 3,000 elephants. They found only 200 animals to be living in acceptable captive conditions. Three-quarters of the captive population were living in “severely cruel” conditions. Many were bound with chains less than three meters long and forced to stand on concrete floors close to noisy roads, crowds, and music. Approximately 160 travel companies have committed to stop selling tickets to or promoting venues offering elephant rides or shows, including TripAdvisor, who’s announced it won’t sell tickets to any wildlife experiences where tourists come into direct contact with wild animals. Elephants are an endangered species. Tourist education and wildlife attraction regulations are needed to help reverse this trend. If fewer people take elephant rides, fewer baby elephants will be captured. It’s as simple as that. Photo, posted December 6, 2015, courtesy of Flickr. ‘Elephant Tourism’ from Earth Wise is a production of WAMC Northeast Public Radio.